Three of our PDQ locations will be partnering with the Dr. Piper Center for Social Services, Inc., which works to enhance the lives of the elderly, at-risk youth, and special needs children, to collect toys for distribution at the Center’s Christmas Party for the children of Southwest Florida. 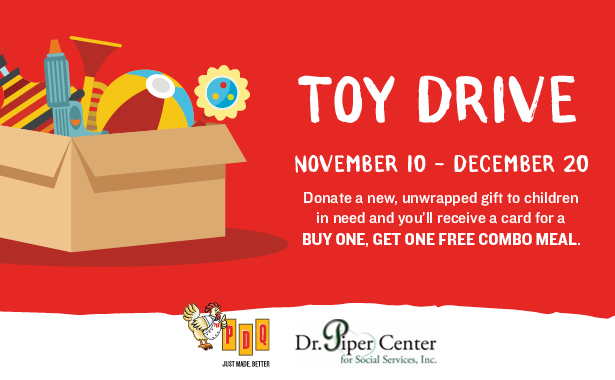 The PDQ Toy Drive will kick off on November 10th at PDQ Ft. Myers: Cleveland Ave., PDQ Gulf Coast Town Center, and PDQ Sarasota and a percentage of sales from each participating location will be donated back to the Dr. Piper Center for its programs that help the community on that day. Guests are encouraged to drop off new, unwrapped toys at either of the three PDQ locations from November 10th through December 20th. In exchange for their generous donation, guests will receive a bounceback card valid for a Free Combo Meal with the purchase of a Combo Meal.